Yes, I did say flies! Those pesky, annoying creatures that buzz around our heads and food are excellent pollinators. I've been hoping to capture at least one photo of a winter pollinator visiting the Hamamelis vernalis at Clay and Limestone. It's been my quest to discover if there is a specialized pollinator. What a surprise to see flies! Not anything special either. They look like, your regular old houseflies, too. But, there they were on a warm February day, nectaring on (and hopefully carrying a bit of pollen to the next flower) the only blooming plants in my garden~the native witch hazels. Flies~have a holometabolous life cycle. Which means they have complete metamorphism from egg to larvae/maggot to adult. They live in water, soil, plants, the sea, streams, lake, rivers, animals and even other insects. They are opportunists and will eat almost anything. That's one of the reasons they are SO important for our gardens...their voracious appetites! Look for their white, oval eggs, singly or in groups on leaves. They'll hatch into green, yellow, brown, orange, or white half-inch maggots that look like caterpillars. You might even see them raised up on their hind legs in order to catch and feed on aphids, mealybugs and even some beneficial bugs. They are beautiful creatures and I am always excited to find them hovering and darting about. Their presence assures me that the garden has a good mixture of plants to attract them and other beneficial insects. To attract them to our gardens we can plant a variety of annual, herbs and native perennials. Achilleas, asters, dill, lemon balm, spearmints, monardas, penstemons, veronicas, zinnias, thymes, sedums, sweet alyssums, fennels, buckwheat, and lavenders are just a few of the many plants you can choose to make your garden a haven for all pollinators. (source and list of flowers to plant). Generally speaking~flowers that are pollinated by flies and gnats have similar characteristics. The arum (below) is a perfect example of a flower that has evolved specifically to attract them. Its rotting flesh 'fragrance' was wafting across the David-Peece garden during our Austin Spring Fling visit in 2008. This arum smells like rotting flesh to attract its pollinator flies and beetles! Personally, I'll pass on the exotic and smelly fly magnets! 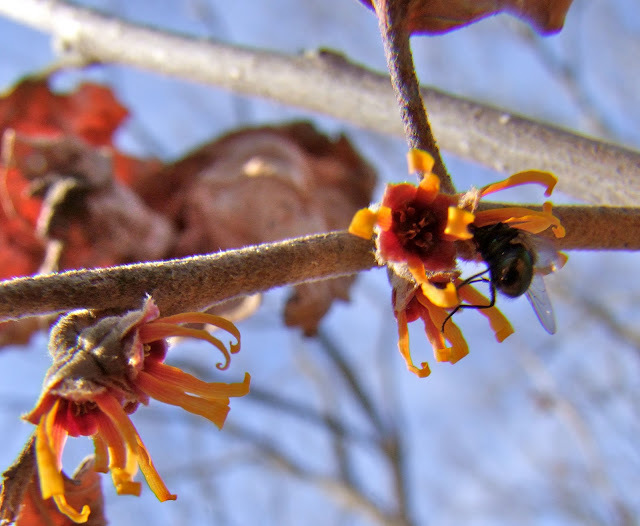 Houseflies, Green Bottle Flies and even Blow Flies are welcome to stop by for a bit of nectar and to pollinate the winter blooming hamamelis. I'll continue to plant for all visiting pollinators~I pinky swear: to plant a diversity of flowers that bloom from early spring to late fall; to provide water; to leave a bit of bare ground; to plant natives and species when I can; and, to never, ever, ever, use pesticides. *Oh my~Blowflies are important in forensic science; their maggots are being used in medical research on wounds; and, they've also been introduced in a greenhouse experiment to see how well they can actually pollinate. Very interesting, Gail, even with the use of the words larvae and maggot! And great pictures of all those flies. Fascinating post - you almost make me long for the scent of rotting meat in the yard. I know I've seen a lot of those true flies out there without knowing what I was looking at. Your macro fly shots are super, esp #4! I can't wait to see these busy flies in the garden again. They do make the garden seem lively with all their buzzing around. I think flies are pretty since most have that metallic body and those eyes. They can see so much with all those eyes. Love your pictures Gail. So crisp and close. Gail,I learned things about flies I did not know and like Cyndy, was looking at an insect sure now were not flies but I never knew that. I thought they were small bees. The flower fly is kinda pretty and you have great shots of them. I am going to look a lot closer this year. Nicely done Gail. I never looked at it this way and learned. Now, bring on the pollinators! another wonderful post Gail..a wonderful way to look at flies...perhaps I won't be as disgusted by them now...and I will pay attention to where they go in my garden....how I love a new adventure!! What a great post on a pollinator that is given very little credit by most people! Your macro shots of the flies are amazing! I saw some flies on my witch hazel this weekend. The pollinators are starting to come out of hiding! Spring must be here! This is very interesting Gail. As we see all types of flies in my gardens and actually never thought too much about them. Other than, 'they must be doing a job or they wouldn't be here.' I'll pay closer attention this gardening season...your photos are spectacular! An excellent reminder to look beyond appearance. What would a world without insects be like? The birds would starve, the flowers would end and on and on goes the circle of life as you have so aptly pointed out. Very interesting. I'll also stick to the unoffensive smelling flowers and enjoy the visits of the hoverflies. They make great subjects of photos. Can I suggest you move your Blog archive to below the post instead of that very narrow sidebar that chops the words up? Thank you for sharing your curiosity with us. I think we all need to know about the natural world around us, and not think we need to leave science to the scientists. And, how much easier it is to ferret out basic information these days! Dear Gail, thank you for not showing a photo of a maggot. Dear Gail, sorry about that. Don overpowered me and took over the keyboard for a moment. I so admire your letting people know the importance of the other pollinators. While I prefer the ones that look more like bees, the flowers really don't care, and that is what is important. Kudos to you for the continuing education. I had no idea that flies pollinated witch hazels, and I didn't know that there was a spring-blooming native witch hazel---I thought the native bloomed in the fall. Flies also pollinate our native skunk cabbage, which also smells like rotting flesh. It also produces its own heat, which is amazing (I did a post about that). All nature is fascinating even flies. This was such an interesting post. I didn't realize how many flies were also pollinators. I've seen a lot of flies out on some of our recent sunny days. Last year the hover flies were all over the lavender. They are fun to watch. Dear Gail, I've seen those flies but didn't know what I was looking at. Thanks. I have baby bumbles on my blueberries & big bumbles on my Daffy's. It's all great. Lots of things blooming here, grape hyacinths, daffodils, peach tree, snowflakes, azaleas in bud, oh, I have one of those stinky plants, which I was told it was a voodoo plant. I just hope my plants will be pollinated. "Taters" & cool season veggies will be put in soil tomorrow. I'm happy to be able to do that. It is nice here. Interesting! I never thought of flies as pollinators. Dear Gail, It is fun to think of Aristotle involved in naming flies. Perhaps there are yet some undiscovered philosophical arguments concerning the morals of flies. I am happy to give my Diptera some better purpose in life by letting them out for the Bluebirds! Here there is not even a tiny fraction of a tepal about to unfurl, for at least another month or so I am afraid. I love your illustration . . . I like imagining a fly with blue eyes and turquoise wings! Hover Flies are those tiny little darlings that will land on our fingers . . . right? You have fabulously captured them here in your fascinating post! I am with you in not planting the arum . . . I tend to enjoy a light sweet fragrance about the garden. It is incredible looking however and truly interesting how plants design themselves to attract specific insects. This titan was meant to be in a rain forest . . . gosh you would hate to see this one get away and spread about the neighborhood . . . but then that would mean more flies for pollination and the Bluebirds! Gail, your garden is already so diverse, as to support a great diversity of beneficial insects and you are inspiring so many to follow your example. This is another interesting post in your intriguing series. I saw a few flies this weekend. It won't be long until they are all over our Bradford pear trees. They do serve an important role but I tend to forget that when one is hovering around me while I work in the garden! We've had flies outside all winter long (well, during every warm spell). They've never completely disappeared this year so that's interesting too since there isn't much in my garden for them to pollinate right now. Oh Gail. I got to "pet" my first bumble this morning. They were asleep in the blooms of the Daffy's. I was so excited I almost woke it up. Hi Gail, that was a really interesting post. I saw flies on my Fatsia japonica flowers last Autumn, noticed them for the first time. Made me feel bad for hating them, but if they stay outside, I'm now a fan! I lvoe hoverflies, or rather what they represent, and hope they are the soundtrack of the spring/summer again. No Gail, they are not cranky at all. Now I go out to see how many are asleep in their blooms.They are so cute. Excellent article. I have been calling attention to all the other pollinators besides bees, such as: wasps, flies, butterflies, moths, beetles, for several years. This is really helpful and educational. Lola, you didn't see baby bumblebees, because the babies are larvae of grubs and stay indoors. What happens is that: 1. there are many different species and they come in different sizes; 2. there are worker and queen bumblebees, with the queens being much larger. But they are all adults. As for petting bumble bees, you can see one: here. Flower flies of syrphid flies are very useful, as mentioned, because in addition to pollination some of them are excellent pest controls because their larvae feed on aphids. See: Syrphid larva devouring aphids, unless you really detest the sight of larvae or maggots.